Don’t connect pin two of the chip to anything. 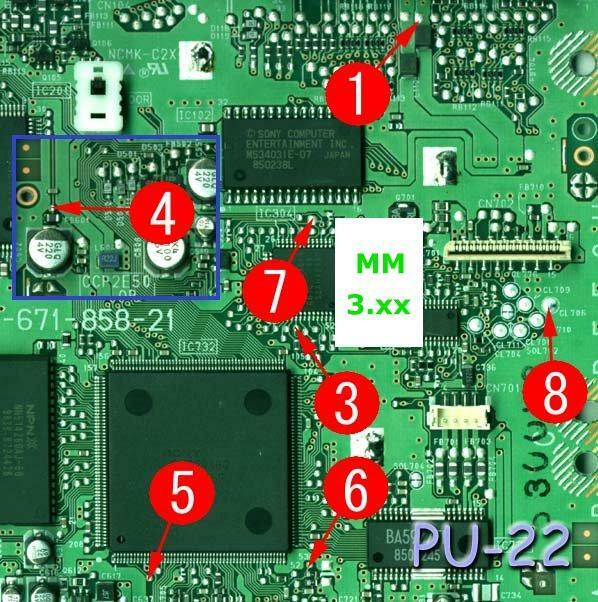 This first images show a cleaner way to install the chip with six wires. I probed the board with a multimeter to find alternate points to solder the wires to that are much closer together. I use the capacitor to the right to get the VCC and GND (pins 1 and 8) connected to the chip with really short wires. Below is a messier installation using the diagram at the top of the page. I’m guessing I don’t need to put the metal shield back? I put the shield back on when I mod systems, but it isn’t completely necessary. Today i modded my new ps1 fat from eBay with this Diagram! The chipped ps does not Play Original pal Games anymore? Why? It should do so, Right? Why does The ps Play a ntsc Backup But no pal Backup? The Chip should Play both types! Where does This cracking stucking sound playback come from within of an Intro of a game? Too Long wires? what is my problem if i can play originals and pal copies but no ntsc games with my chipped ps? 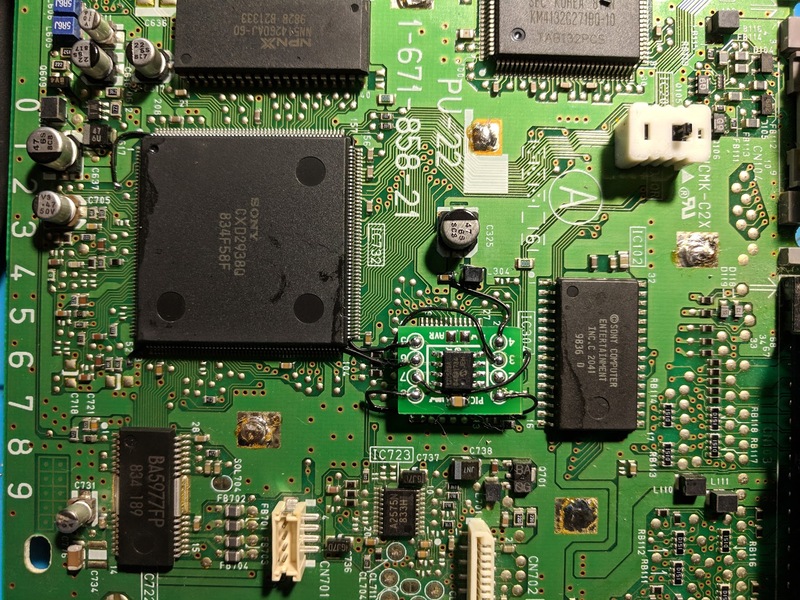 PAL SCPH-101’s (PM-41 or PM-41 (2) boards) have an additional region lock which prevents out of region games from playing, unless a ONEchip is installed. It could also be a problem with the TV not being able to display NTSC video. If it can play PAL game backups then the chip is probably installed correctly. Is probably number 1 in the diagram for the ntsc region? 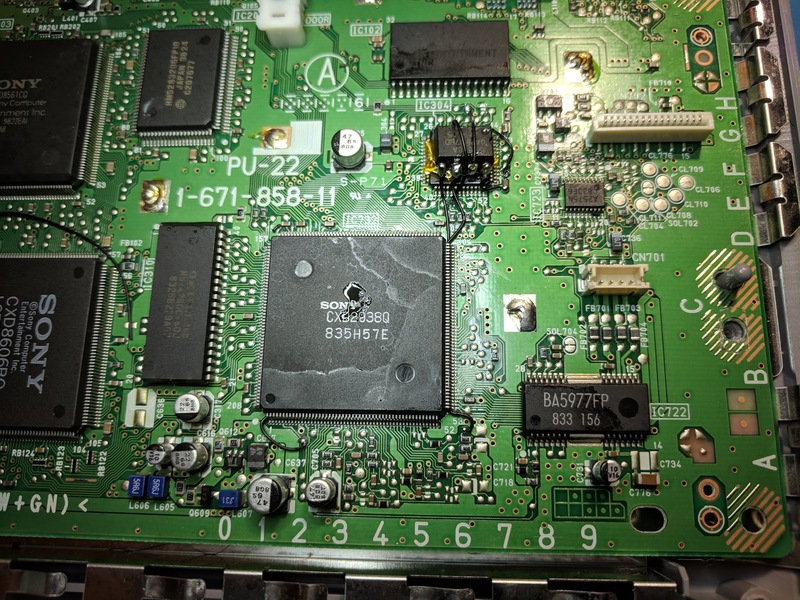 I guess that one soldering contact isnt right then…with a ntsc backup the cd player menu pops up, tv works fine. 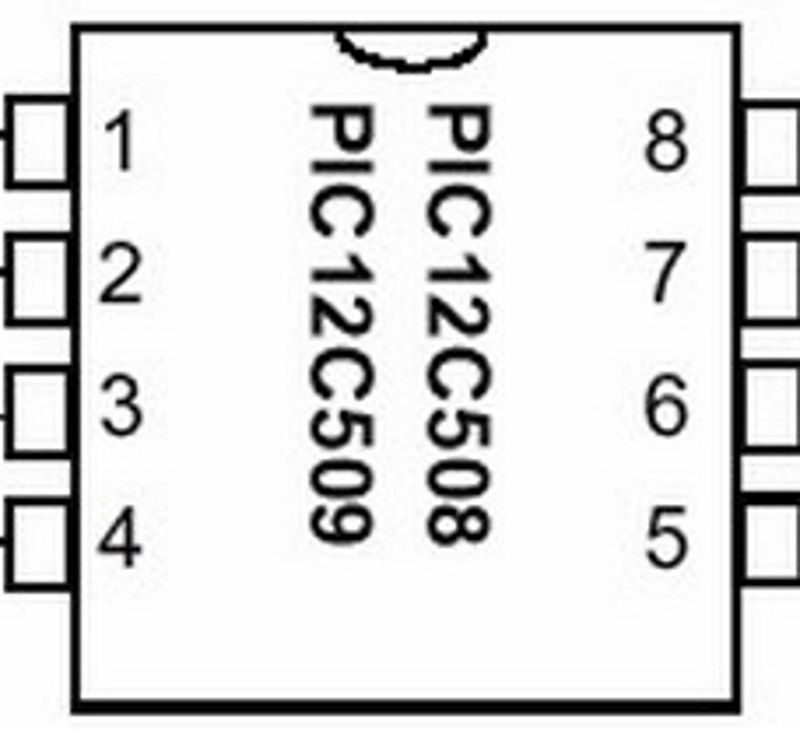 Pin #1 is to power the chip, regardless of its region. If you email me pictures of your installation (liam@quade.co) or reply to this with a link to pictures (using Imgur or something) I can take a look at the soldering. Again, if it can play PAL game backups then there isn’t really a reason why it shouldn’t be able to play NTSC game backups. Worked for me on my 22! Why isn’t pin 4 required? I think pin 2 is for non-stealth firmware (rough google) but why not 4. 2 is for the clock pin, but only for Mayumi chips. For MM3 I believe there is a way to hook up an LED to pin 2. 4 is the one used to switch between modes using the reset button. It was useful for older chips that didn’t support stealth mode to play anti modchip games. Since the MM3 can play every game there is no need to use the reset button to disable it, so no need for pin 4. Followed the instructions and installed MM3 to my original PlayStation from my childhood. Thanks very much. Yes, the higher the percentage alcohol the better. I always clean the flux off of the points I solder to when I’m done. Hello I need help. When I turn on my playstation there’s no display. The spinner isnt running but the laser on the cd spinner is on. Look around the board for any possible solder that could have splashed somewhere it shouldn’t have. Also make sure your wires aren’t too long (they need to be as short as possible). Shorten all of the wires to be as short as possible. Hey there, just recently installed the modchip, thanks very much for the guide! It’s been working with nearly everything so far but it doesn’t want to load Pop’n Music 2 (NTSC-J), any time I try to play it I get the anti-modchip “software terminated” screen. 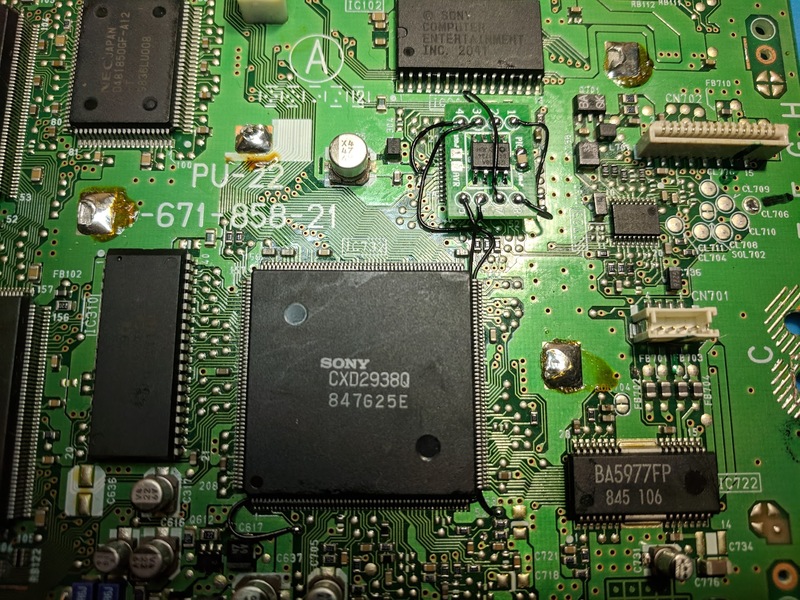 Everything else works perfectly including other NTSC-J games and Spyro 3 (PAL version) which I had heard had anit-modchip protection programmed in. Is this a compatibility issue with the MM3 itself or should this game work fine and this suggests that there’s something not wired up correctly inside? Thanks for your time. Some extra information: I’m using a PAL SCPH-7502 model PS1. I’ve done a few more tests with other games, NTSC-U Crash Bash also works fine but Dokodemo Issho does not. 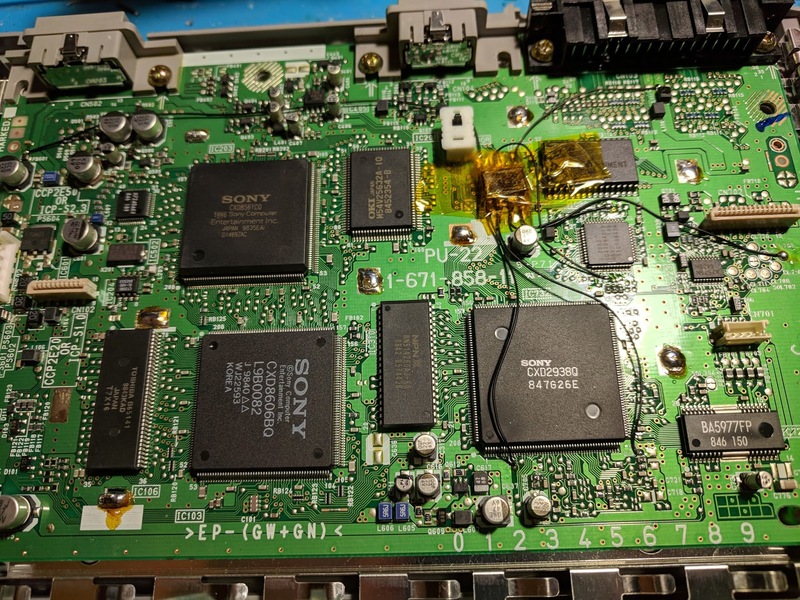 It seems like Japanese games with anti-modchip screens are the problem, although I have managed to run NTSC-J Crash Bandicoot 3 without any issues.